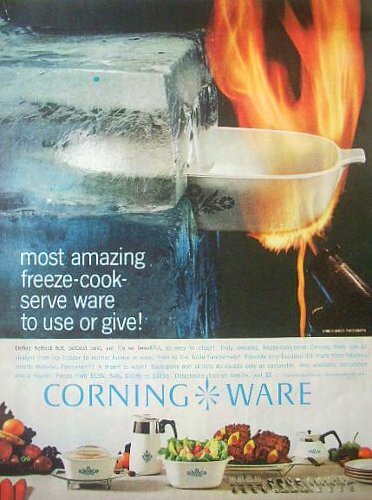 The most incredible thing about Vintage CorningWare is it's ability to withstand temperature changes without shattering. A "glass" cook top. In this case, a Vitro-Ceram/Pyro-Ceram/Ceramic Glass cook top. (basically it's the same material as Vintage CorningWare was made of) The problem with these cook tops is that the bottom of your pan needs to make 100% contact with the surface. This is a problem for a lot of cast iron as even enameled versions can have a raised ring on the bottom. This ring prevents the bottom of the pan from touching the stove top. OK, except for the actual ring itself. Thus, cast iron, for the most part, is unusable on these types of stoves. Which is a bummer, cause I LOVE Pineapple Upside-Down Cake. Historically this particular cake is made in a cast iron skillet. Well, that isn't happening anytime soon, or at least not until I have access to a gas stove again. This is where Vintage CorningWare comes in. Not only does it have a flat bottom, thus making full contact with your glass cook top, but it's properties are very similar to enameled cast iron in many respects. (the flat bottom is how you tell Vintage CorningWare from the current stoneware facsimiles). It is a little slow to heat up, but once it does, it holds the heat very well. Just like cast iron. The surface is as smooth as, well, glass. This gives it the same "Non-Sticking" qualities as the enamel used on cast iron. And since you can use it on the stove (Vintage CorningWare ONLY) the preparation method for Pineapple Upside-Down cake is exactly the same as it would be in a cast iron skillet. With that conundrum solved it's time to hit the stove.... Don't worry, the bottom of the pan says it all. See? For "Range and Microwave". Obviously this pan was made at some point in the 1970's after microwaves hit the market. So grab the butter and let's get this cake a goin'. OH, but before we do. If you are going to use a conventional cake pan (not a cast iron skillet) preheat the oven to 350 F (175 C) and bake 45-50 minutes instead. Sprinkle 1/2 cup (3.5 oz) (100g) Brown sugar over the melted butter. Drain the pineapple slices (reserving the juice) and arrange the rings on top of the brown sugar. Set the pan aside and begin preheating the oven to 325 F (165C) degrees. In the bowl of your mixer, cream 1/3 cup (5 1/2 TB) Unsalted Butter with 3/4 cup (5.25 oz) (150 g) Brown Sugar. Add the egg and beat until emulsified. Whisk AP Flour, Baking Powder and salt together in a small bowl. Add enough water to the Pineapple juice to make 1/2 cup (118 ml) though you may not need to do this. Spread the batter gently over the Pineapple rings. Let the cake stand for 5 minutes before unmolding onto a plate. I like to top it with a small dollop of unsweetened whipped cream. And Voila! Almost everything is already gone... True, it needs a little soap and a sponge. It IS caramel after all... :) But taking that fact into consideration, the clean up is pretty easy. Look at those luscious home made maraschino cherries makes pineapple upside down cake even better, didn't know that was possible.